Showing 3 articles from March 1, 2013. Photo Courtesy of Laura Rohr From left are Willapa Valley students Chahayla Barton and Brooke Harden at the state capital. 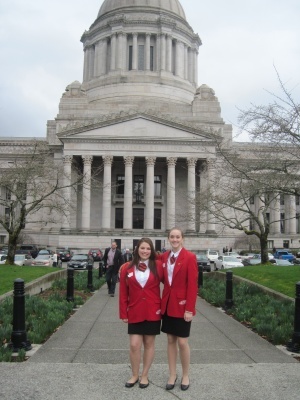 Willapa Valley FCCLA members and state officers, Brooke Harden and Chahayla Barton, attended the 2013 CTE (Career and Technical Education) Legislative Day last Wednesday. Many people have heard of David slaying Goliath with a rock and sling, but do people connect the sling to the development of the trebuchet? Alice V. (Christenson) Street passed away quietly on Valentines Day, February 14th, 2013. She lived in the Raymond, Wash. area most of her life, until she moved to Bonney Lake.